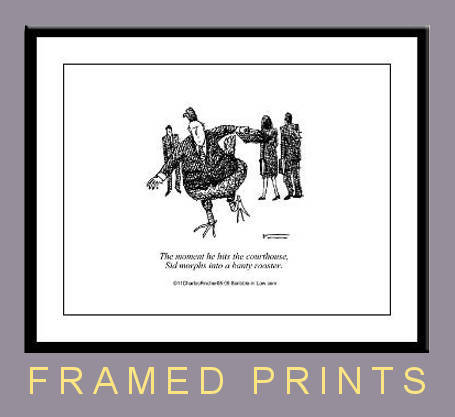 These framed prints are reproductions of law cartoons in the regarded LawComix.com collection. The prints are on an acid-free paper with a backing for a crisp flat surface. The sylish, black framing and white matting bring together an art piece that looks great in the office or home. The frame size is 16" x 13" for single-panel cartoons and 19"x11" for horizontal comic strips. These are not signed prints. Click on any cartoon, below, to see it as a framed print and add to your shopping cart.